I brought these to work and people went bananas! I've learned over years of bringing treats to parties, work, friends' houses, etc, that certain flavor combinations are definite hits with crowds. And the popular opinion whole-heartedly supports chocolate and banana together. These brownies are the real deal. They mean business. Monkey business. So so good! I doubled the recipe and used 3 ripe bananas I had on hand. The recipe supposedly comes from the California Walnut Board. Did you know such an organization existed? That's some serious dedication to a nut! The "supposedly" above is because my mom sent me the recipe, which she had saved on a recipe card in a binder, and can't recall for sure, but thinks it's from that walnut board. I'm going to assume she's right. 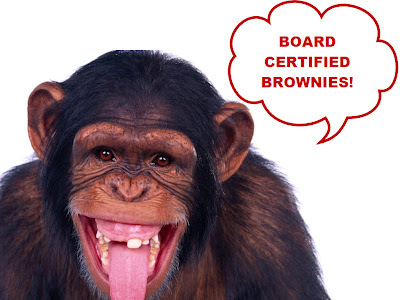 Because board certified brownies simply sound better. It's like they passed a test or something. And hey, based on the faces of the lucky recipients of the batch I made, they passed with flying colors. Heat oven to 350 degrees. Grease bottom only of 8-inch square pan. I like to line my pan with foil and then grease the foil so it's easy to lift the entire tray of brownies out and slice on a cutting board. In a saucepan, melt together the butter and chocolate. Remove from the heat and beat in the flour, sugar, mashed banana, vanilla, baking powder, salt, egg, and walnuts with a wooden spoon. Bake 20-25 minutes or until center is set (do not overbake or the brownies will be dry). Cool in the pan on a wire rack, then cut into 2-inch squares. Or smaller, bite-size squares, which is my preference. Cool, then slice and serve! Maybe I'll make these for work this week. I baked banana bread yesterday and I still have extra ripe bananas. Does this sound like a healthy breakfast dish? I think so and they look so yummy! Bananas in brownies? Who would have thunk? But it makes perfect sense. Heck, we put chocolate chips in banana bread all the time, so why not put some banana in brownies. It's only fair. And I bet it's irresistible. Anyway, this recipe looks delicious (I've been scouring around for something exactly like this) and if it's Board Certified, how could I go wrong? Going to go make them now! ETA: These are FABULOUS brownies. Followed your lead and doubled the recipe/tripled the banana and they are killer diller! I tried this and its so delicious! Its moist not dry.